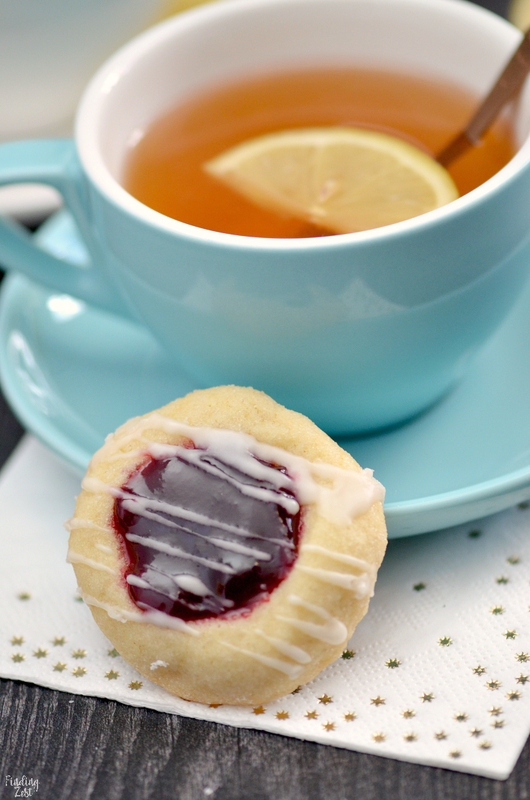 Raspberry thumbprint cookies are a perfect dessert for Valentine’s Day, Christmas or any time of year! Learn how to make these thumbprint cookies with icing, including the best time to add jam to your cookies. Should you add jam before, during or after baking? I’m sharing my results for this classic cookie recipe. Last week my kids had no school for three days due to the Polar Vortex that hit the midwest, including my state of Minnesota very hard. It was the perfect opportunity to spend time in the kitchen with my mini chef Wesley. His favorite thing to make is cookies. 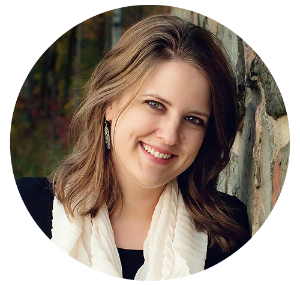 While I love to eat cookies, I can’t actually eat them right now as I’m finishing up my Whole30 diet. That means no sugar or flour (or a host of other things) for 30 days. 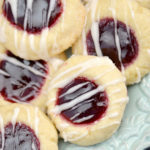 Making delicious jam thumbprint cookies was a special kind of torture that I’m willing to endure just for my sweet kid. Not a lot of ingredients are necessary to make raspberry thumbprint cookies. If you want a true shortbread cookie all you will need is one part sugar, two parts butter and three parts flour along with raspberry jam. I’ve always liked the texture better when egg, baking powder and salt is added. For this recipe I also decided to roll my cookies in sugar before cooking and drizzled a simple vanilla icing over the top. To make thumbprint cookies you’ll need to start by creaming your room temperature butter, sugar and vanilla (or almond) extract. You’ll want to be sure to cream until nice and fluffy. This takes a couple of minutes on a mixer speed of 3 or 4. You don’t want to over beat it. Add in your egg and beat some more until it is incorporated. 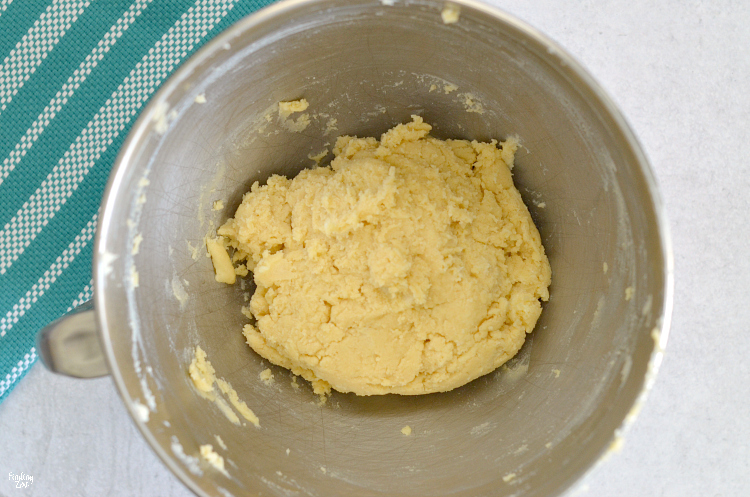 Stir together your flour, baking powder and salt and mix in slowly (or intervals) into your butter mixture just until combined. Chill your dough for one hour. If you don’t chill long enough the dough can be a bit sticky and hard to work with but if you chill too long the dough can become crumbly and hard to work with. 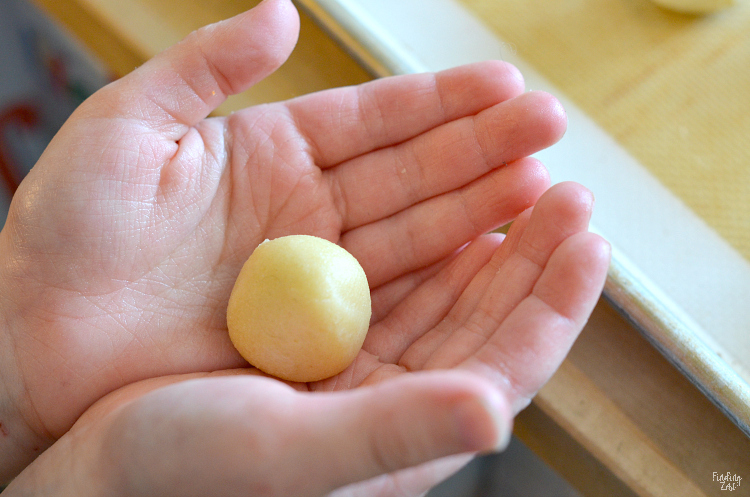 Roll your dough into approximately inch balls. Exactly how big will affect how many cookies you get from this dough and cooking times. I was able to make 42 cookies with this recipe. 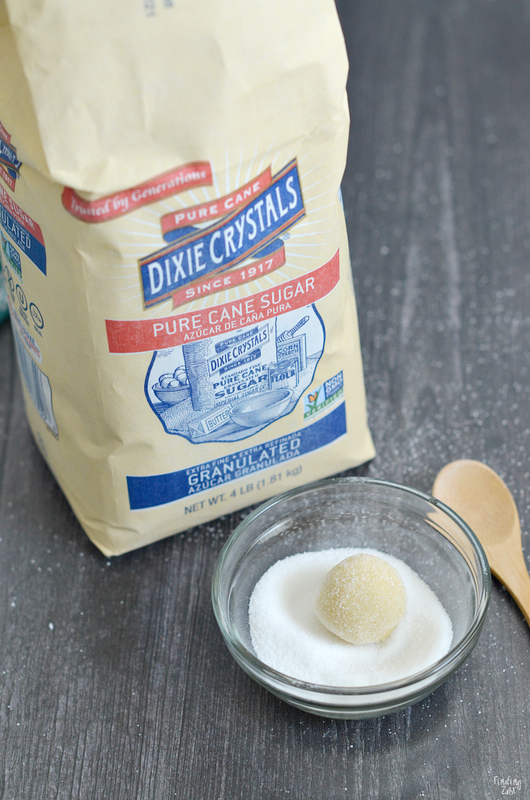 Since this cookie isn’t overly sweet, I decided to roll my balls in some extra fine cane sugar. 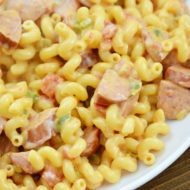 You can skip this step but it does add some nice flavor. To make our indentations in our cookies, we used a round 1/2 teaspoon measuring spoon for even holes. You can also use your thumb, although I recommend pressing twice with your thumb on opposite sides so it is even. If your cookie develops cracks while doing this, gently press the sides back together. Now your cookies are ready for baking! 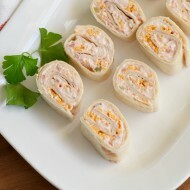 Bake at 350 degrees for approximately 13 to 16 minutes, just until the edges turn slightly golden brown. 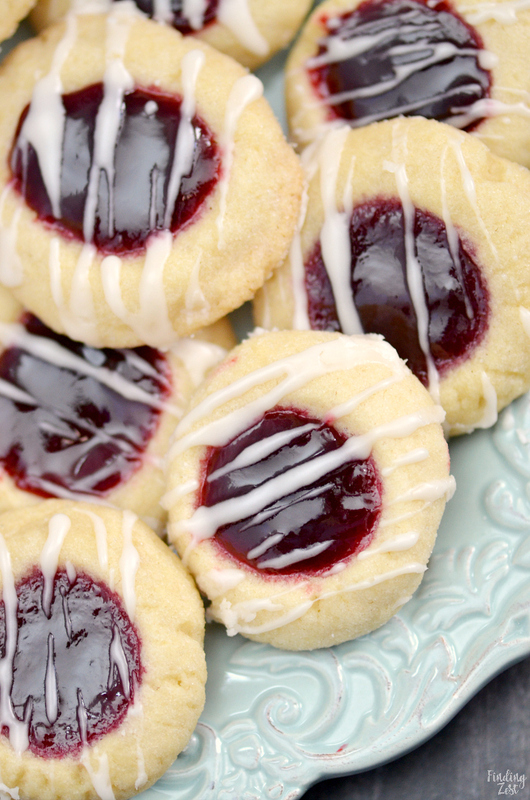 When should you add the jam to your thumbprint cookies? I wanted this question answered for myself. I’ve seen recipes call for the jam added before baking, halfway through baking, after baking and after baking with warm jam. Which way is the best? 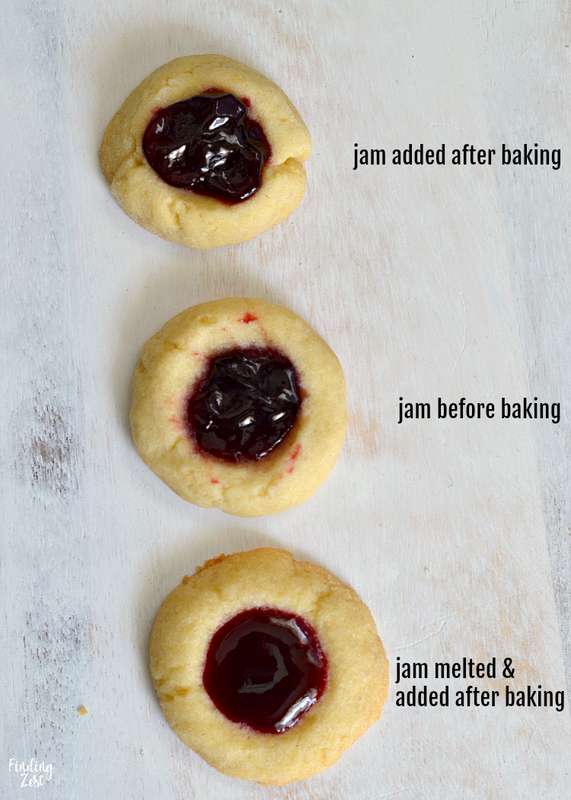 I did three batches for this recipe: before, after and after with melted jam. Adding the jam in before cooking resulted in a slightly sloppy cookie. 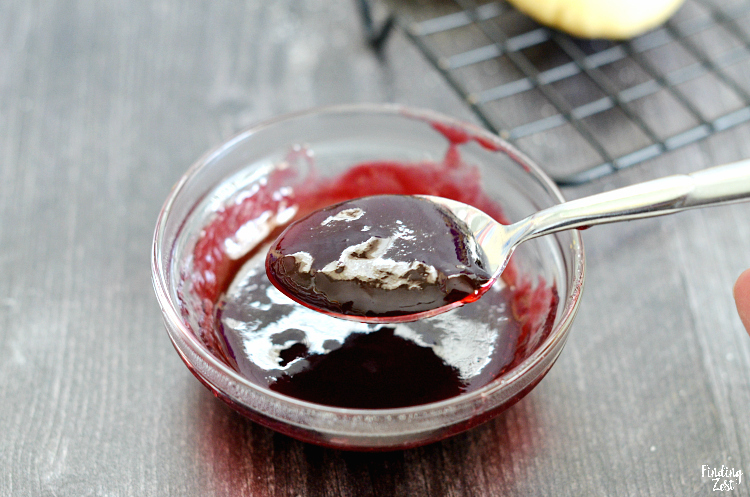 Parts of the sides of the cookie became dyed with the jam as it spread out while baking. Small holes were created at the bottom of the cookie where the jam had melted through a bit. I thought the jam would melt to create a smooth top but it didn’t. Adding in halfway through baking would have helped with these downsides. Adding the jam after baking worked better, but it didn’t look as pretty. It also makes it harder to stack the cookies once cooled. It was a little awkward filling them. Adding warmed up jam after baking worked by far the best. Not only was it the easiest to fill just using a spoon but it created a beautiful, flat surface on top. 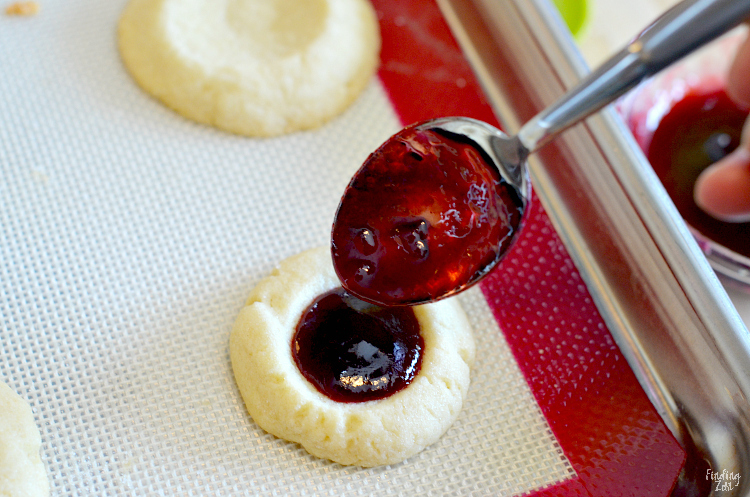 Adding warmed jam to already baked thumbprint cookies is so easy. I was able to fill all the cookies so much faster than when I used jam at room temperature and it created a much neater cookie. I like thumbprint cookies with icing because they really finish off the look of thumbprint cookies without nuts. 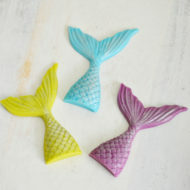 They also make the cookie a bit sweeter which is nice since the cookie itself doesn’t have a lot of sugar. I used a mini drink whisk for both mixing my icing and drizzling over the top. I like vanilla extract but if you prefer raspberry almond cookies you could replace it with almond extract. 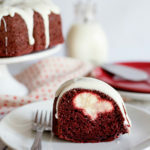 Keep in mind that if you do add icing, over time the red raspberry jam will color the white icing red over the center. 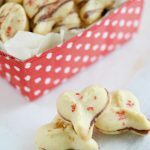 Raspberry thumbprint cookies are a perfect dessert for Valentine's Day, Christmas or any time of year! 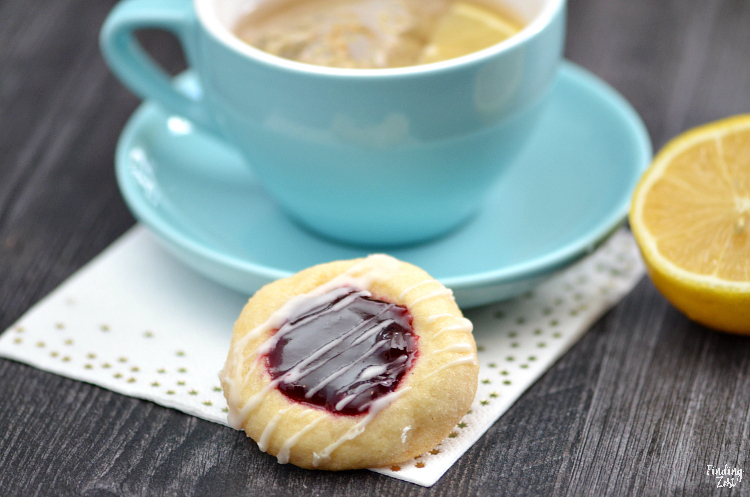 Learn how to make these thumbprint cookies with icing, including the best time to add jam to your cookies. Should you add jam before, during or after baking? I'm sharing my results for this classic cookie recipe. In medium bowl stir together flour, baking soda and salt. In large bowl cream butter, 1/2 cup granulated sugar, and vanilla extract. (Approximately 2 to 3 minutes on speed 3) Add the egg and beat well. Gradually beat in flour mixture. Chill dough for one hour only. Preheat oven to 350°F. Line baking sheets with parchment paper or silicone baking sheets. (Alternatively you can grease your pans) Place remaining 1/4 cup of sugar in small dish. 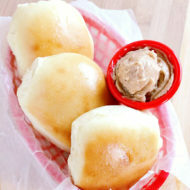 Roll dough into 1-in. balls. 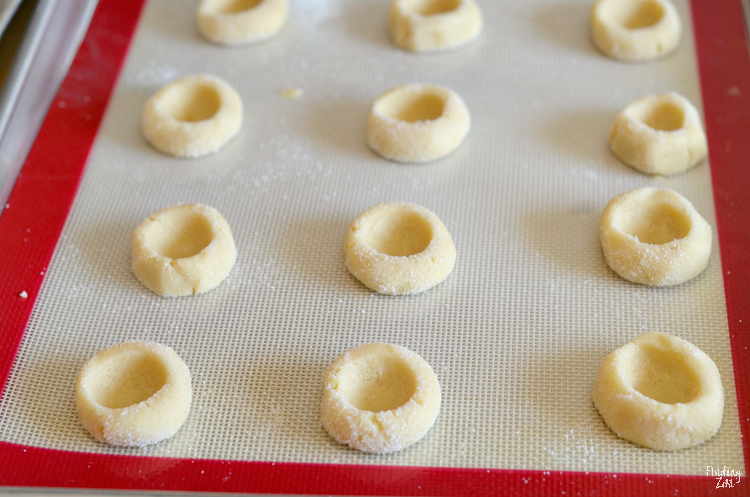 Roll balls into sugar and place 2 inches apart on baking sheets. Using your thumb, 1/2 teaspoon rounded measuring spoon or end of a wooden spoon handle make an indentation in the center of each ball. Bake 13-16 minutes or until the edges are slightly browned. Remove to wire racks. 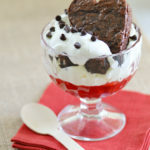 Place jam in small bowl and melt in microwave. 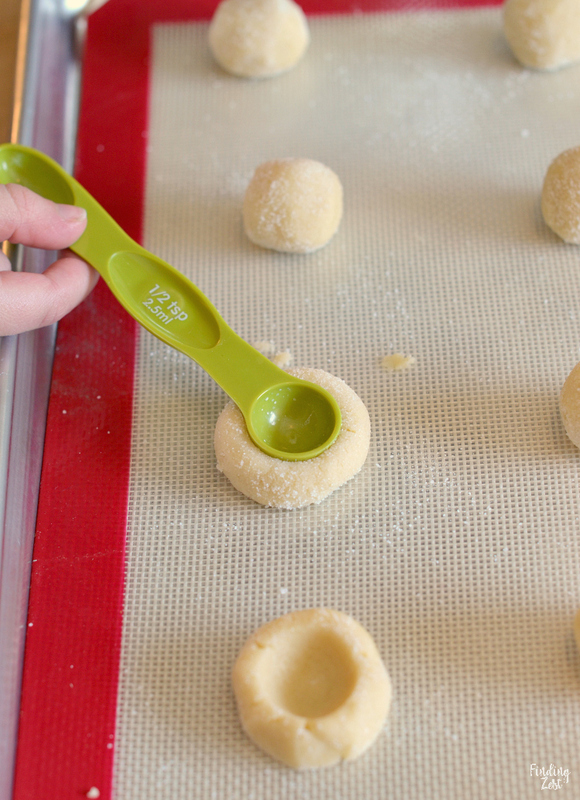 Spoon jam into baked cookies. Cool completely. 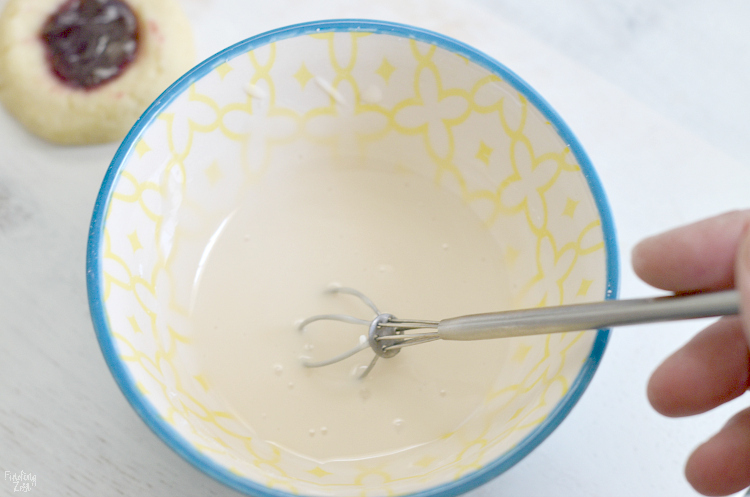 To make glaze, combine combine confectioners' sugar, extract and water until well mixed. Icing should be fairly thick. Drizzle over cookies. Store in airtight container in a cool place with parchment paper between layers. You can also add jam in before baking or after baking without melting the jam, depending upon personal preference. I found that melted jam makes for a pretty presentation and is easier to stack. Note: Over time the white icing will be tinted by the jam. I am committed to this diet so I used the opinion of my family. 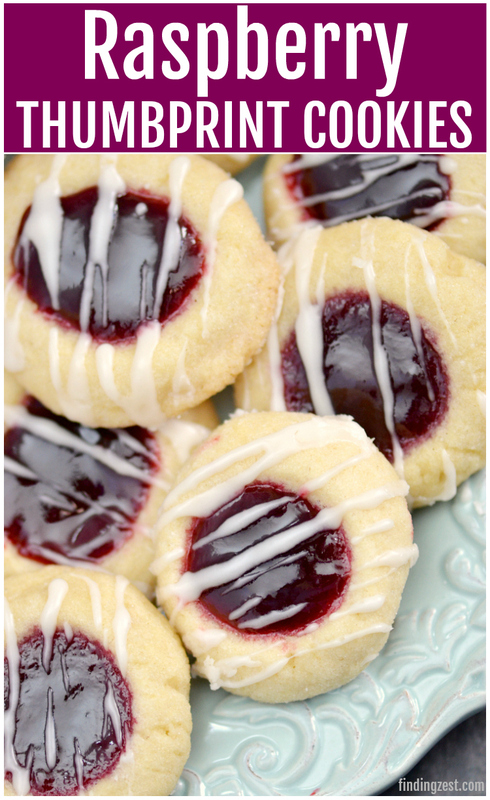 According to my kids these raspberry thumbprint cookies are amazing. 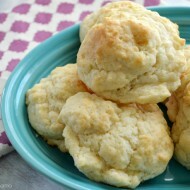 They found them to be buttery, flavorful and a little on the crunchy side rather than chewy. My youngest son gave it 10 out of 10, my oldest 9.5 (because he says he has to leave room just in case) and my middle son an 8 because he has a preference for chewy cookies. Even though I’m committed, I did try one bite to test the flavor and texture before spitting it out. And man, these cookies are really good so spitting it out was HARD. 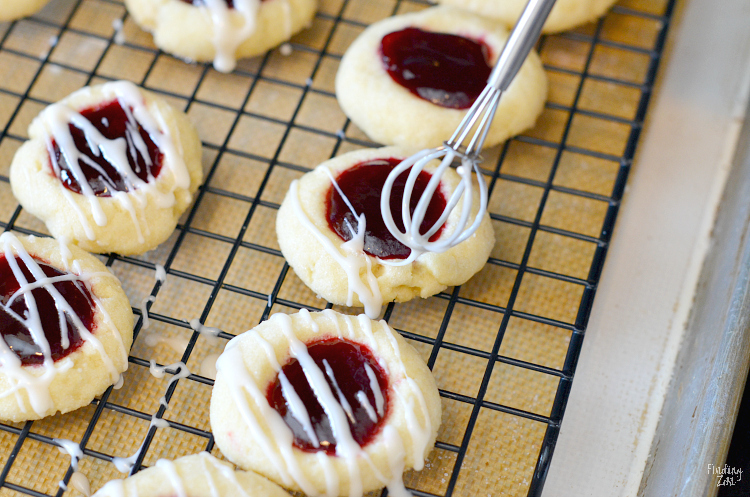 These raspberry thumbprint cookies are the perfect Valentine’s Day dessert! 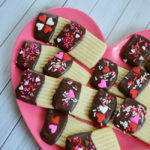 I created this raspberry thumbprint cookies post to be part of a special Valentine’s Day event in its third year! We want to make a difference in the fight against pediatric cancer! 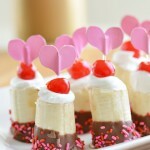 Check out all of the other amazing Valentine’s Day dessert recipes from other bloggers participating. 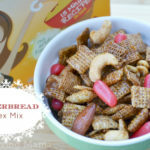 Emilie, You are wonderful for creating and sharing this lovely recipe for such a worthy cause!